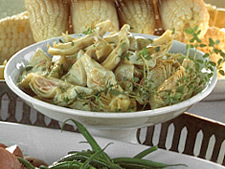 And last but not least... my favorite way to eat artichokes... steamed with a lemon mayonnaise sauce... YUM! 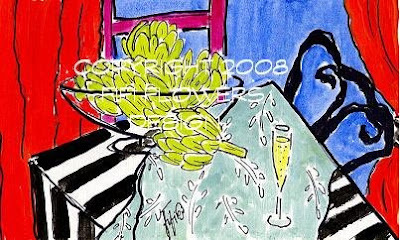 In need of fruit or vegetable illustrations... original artichoke paintings by Fifi is available... email me... Sooooooo... Artichokes... love 'em or hate 'em? Lovely post! Artichokes make a gorgeous display. They always look so beautiful...I was very excited to buy some at the markets last weekend! love them! and your collection in this post. i love thos veggies. yum. thanks for sharing all the cool photos. I love artichokes...the way they taste and LOOK. Great selection here and wonderful paintings as always! Oh Fifi, you spoke my language this morning! I love everything about ARTICHOKES! YUM!!! Steamed followed by leaves dipped in warm lemon-butter for me! I also buy artichokes with really long stems and let them dry to hang in groups. LOVE them to eat and decorate with! mmm LOVE them! Especially the light fixture AND steamed with sauce. definitely love your paintings of artichokes and like eating them if someone else prepares them. thanks for visiting our blog! Fifi -- love the way you've put everything together, from the lovely collectible box, all the different recipes, and your paintings -- such fun. I totally *hate* artichokes, but I like the theme you've got going. Very interesting! fantastic post about the elusive artichoke! i will have to find artichoke magazine! Yummy artichokes, in Belgium we eat a lot of artichokes, especially for lunch, mmmm. I love the artichokes box, I could put my tiny treasures in there, how cute! 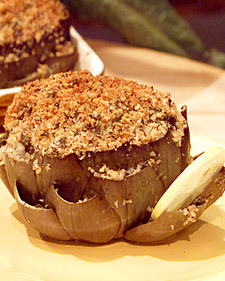 Looks like most people love artichokes!